← New Forest: close encounter of a furred kind! 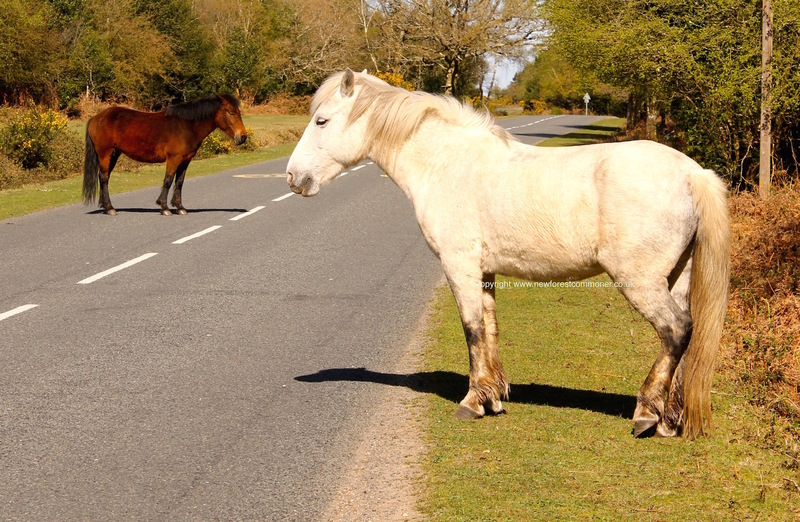 The free-roaming ponies use the New Forest road system at all times of the year, day and night. Over the past couple of weeks (February 2017) there have been a series of collisions on the B3078 – Roger Penny Way – that have resulted in the deaths of several New Forest ponies. In one incident, although the driver escaped with minor injuries, the pony was killed when it went through the windscreen of their VW Polo. Graphic photos of the pony corpses resulting from these several collisions have been made into an awareness campaign circulating various social media sites, and a petition is being organised by animal lovers to reduce the speed limit on that road. Emotions are certainly running high. According to statistics, which are available from the Verderers of the New Forest, the vehicle most associated with animal deaths or injury by far, is the private motorcar; and the driver of that vehicle is most likely to be a local person. The biggest contributing factor cited in the cause of animal deaths on New Forest roads is excessive speed. Indeed, in the same week that the pony deaths, described above, occurred, Hampshire Police Specials, in one shift alone, issued speeding fines to six motorists all doing over 50mph along the B3078, Roger Penny Way. The New Forest is a special place, with special qualities, to which the free roaming, commonable animals are an asset. It is a place unlike anywhere else in the world, and perhaps its speeding laws should reflect that, by imposing fines far more severe than elsewhere. Drivers killing or injuring commonable animals should perhaps face a driving-ban or risk having their car impounded if speed is found to be a significant factor in the incident, and those drivers who commit ‘hit and run’ offences should be dealt with punitively. Maybe the animal corpses ought to be left out beside the roads for longer periods to serve as a warning to road users. Rather than fence more New Forest roads, as has been suggested, perhaps we ought to consider closing them – particularly at night! But, before we get too carried away, when viewed in the bigger picture, there is some hope that the situation may perhaps not be as bad as it seems at present. It could be that these particular incidents, as mentioned above, which occurred over a short period of about a fortnight, coinciding with perilous weather conditions, including dense fog, ice and freezing rain, are actually a series of unfortunate accidents. According to the Verderers’ statistics, the overall trend for collisions, which result in the death or injury of a commonable animal, are actually on the decrease. (These figures are based upon the ratio of animal accidents to the number of animals turned out on the Forest.) This trend needs further analysis but could be due to the actions of statutory organisations, including the Verderers, Police, Forestry Commission, New Forest National Park Authority, Hampshire County Council and New Forest District Council who promote initiatives to reduce the rate of animal death or injury further. Then, of course, added to these efforts are those undertaken by local groups, such as Commoners Defence Association, New Forest Trust, and the Parish Councils; and the overall picture is one of safety for the commonable animals being a concern, not only at the highest level of authority within the New Forest, but widespread across its many communities; indicating that recklessly speeding drivers are truly in the minority. Animal Casualty sign, which is used to mark the sight of an animal injury or fatality. This entry was posted in New Forest, New Forest Animal Road Traffic Accidents and tagged B3078, car, Commoners Defence Association, commoning, death, driver, Forestry Commission, graphic, Hampshire County Council, image, injury, motorist, New forest, New Forest District Council, New Forest National Park Authority, New Forest Trust, Parish Council, police, ponies, pony, Roger Penny Way, speeding, Verderer. Bookmark the permalink.